In spite of a cardinal importance of protein synthesizing system precise working, regulation of ribosomal RNA (rRNA) transcription in humans is far from solution. The only well studied organism among vertebrates in this regard is the mouse. Organization of the mouse rRNA gene pre-promoter region (about 2kb before transcription start point) is typical for a number of eukaryotes but differs significantly from this one in humans and higher primates. In the last few years scientists begin to understand the multiple links between rRNA biogenesis and cancer. 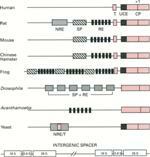 Cancer cells commonly harbor mutations, all of which promote Pol I transcription and drive cell proliferation. It means that a study of peculiarities of rRNA expression regulation in humans is of special interest for elaboration of new anti-cancer drugs. Our review is devoted to comparison between rRNA transcription regulation in humans and other vertebrates for revealing specific features of this process in humans.